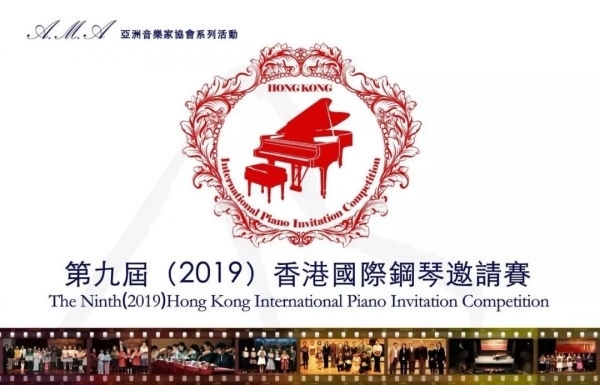 As major events sponsored byAsia Musicians Association, the annual Hong Kong International Piano Invitation Competition, Hong Kong International Violin CompetitionandHong Kong InternationalChamber Music Competitionhavebecome the most important art events for youth in Asia. 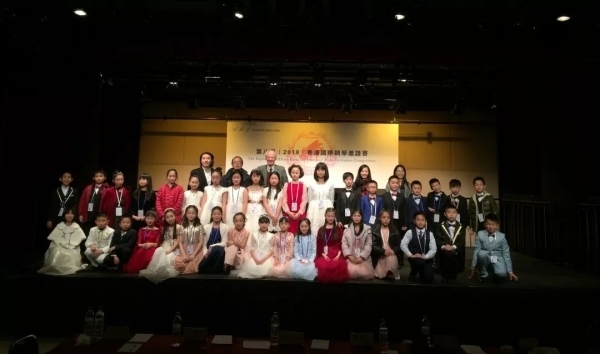 Each year we invite well-known concert performers and educators from Europe, America,Singapore,Korea,Russia,Mainland China，Hong Kong, Taiwan and Macau to be our judges, and offer the players from all over the world an opportunity to learn from each other and a stage to show themselves. By announcing the results and issuing the bonuses and certificates locus in quo, our fairness has won the appreciation from all people. At the same time we also have an advantagethat for every competition we invite well-known composers to create newworks as part of the competitionrepertories，which increases its authority. Through our competition, manyyoung players have enteredtheir ideal colleges and universities, or moved toward higher music stages. Suchfavorable social effect inspires us to carry on the event with greatest enthusiasm. Alain Le Pichon（France）：Famous pianist, educator, writer, scholar. He graduated from Paris and Oxford University. He was a professor of Sorbonne, schoolmaster of Eton, banker in London and New York, entrepreneur in Hong Kong. He gave many concerts and made several records. Ned Kirk （USA）： Renowned pianist, Ph.D of University of Washington, Artistic and Managing Director of The Minnesota Beethoven Festival, Chair of the Music Department at Saint Mary's University in Winona, Minnesota，Director of Graded Music Test Committee. 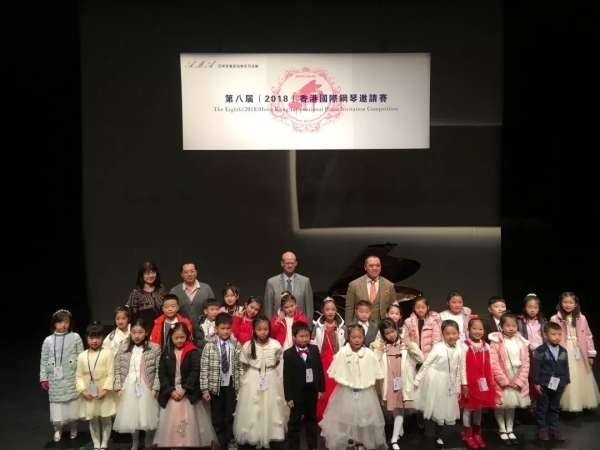 Norman Lee （Hong Kong）：Renowned pianist， Steinway Artist, Piano Instructor at Department of Music of Hong Kong Baptist University, Department of Music of Hong Kong Chinese University and Classic Music Performance Division of Baron School of Music (Hong Kong). and B.M. from New England Conservatory. She was a Teaching Fellow at The Juilliard School and an Adjunct Instructor at New York University. She is a member of Pi Kappa Lambda (U.S. music honor society). Currently, she teaches at Hong Kong Baptist University and The Chinese University School of Continuing and Professional Studies. Yushu Pei（Hong Kong） Dr. Pei Yushu received his Doctor of Musical Arts (in Piano Performance) degree from the University of North Texas, where he studied with the world-renowned pianist Joseph Banowetz. Dr. Pei currently teaches piano at The Education University of Hong Kong. Damin Ren（China）：Famous composer and theorist, Professor of Xinghai Conservatory of Music, China. He is many conservatories’ visiting professor, such as Central Conservatory, China Conservatory, Shanghai Conservatory. His music work won Award of Outstanding Composition in important international music competition. Ming-Hsiu Yen（Taiwan）：Renowned composer and pianist. She received DMA degree in Composition and MM degrees in Composition and Piano Performance from the University of Michigan, and is currently Associate Professor at the Taipei National University of the Arts. She was awarded international prizes, including the Yoshiro Irino Memorial Prize and the Grieg Festival Young Artists Competition. Sui Ming Chu（Hong Kong)：Concert pianist, certified Dalcroze Eurhythmics teacher. Graduated from London's Guildhall School of Music and Haute Ecole Specialisee de Suisse Occidentale: Institut Jacques Dalcroze, Geneva. She has taught in HKAPA and now teaches in Shanghai Orchestra Academy. Shealso founded the HK Dalcroze Center. Liu Yuntian（China）： famous youth pianist. He studied in the U.S. and received his master degree there, now teaches at Xinghai Conservatory of Music. Being as the youngest pianist, he won the first prize of Gold-bell Award in China. He also won the highest honor in the International Vladimir Horowitz International Piano Competition and Queen Elizabeth International Piano Competition. Maria Jee （Korea）： Renowned pianist in Korea、United States and Hong Kong, Chamber Music and Collaborative Pianist at the San Francisco Conservatory of Music, Pianist at the Hong Kong Academy for Performing Art. Kawai Chan（Hong Kong）：Lecturer in Music at Hong Kong Baptist University.Doctor of Musical Arts(Piano)of Michigan State University.Kawai has taught in different universities in the United States and Hong Kong and won many competition prizes.She had given performances throughout the United States,Italy,Austria. Genevieve Wong（Hong Kong）: Renowned pianist, Piano Instructor at Classic Music Performance Division of Baron School of Music (Hong Kong). She studied at New England Conservatory of Music where she got her Bachelor Degree and then studied at The Juilliard School where Master Degree. She won the award in the Five Towns Music and Art Foundation in USA, and performed in many American concert halls including Lincoln Center in New York. Cecilia Long （Macao） ：Mphil, B(MUS), FRSM, FTCL, Director of Macau Chamber Music Association, guest pianist of the Macao Orchestra, lecturer at the Hong Kong Academy for Performing Arts and the Hong Kong International Institute of Music. Wei-En Hsu （Taiwan）：Famous Pianist , Conductor and Composer. He is the Founder/Music Director for Pocket Opera of New York, and the Executive Director for Metropolitan International Music Festival. Lecturer at the Hong Kong Academy for Performing Arts. and as soloist, he collaborated withseveral Hong Kong orchestras. He is also good at piano improvisation. Matthew Tommasini （USA） ：has been awarded top prizes including the Charles Ives Scholarship from the American Academy of Arts and Letters and the ASCAP/CBDNA Frederick Fennell Prize. Mr. Tommasini holds degrees in composition from the University of Michigan (DMA, MA) and UCLA (BA) . 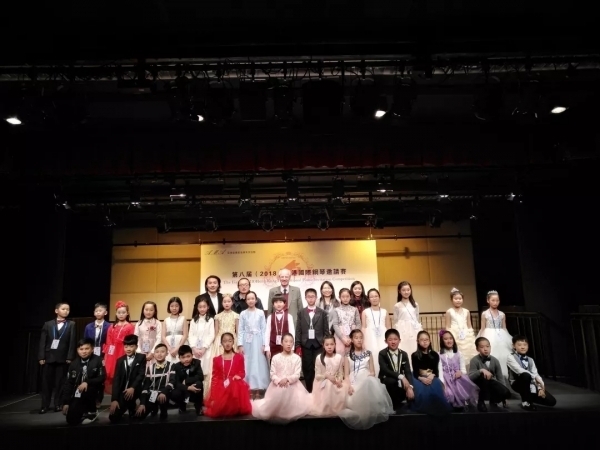 He is Associate Professor of Humanities Practice in Music Education at The Hong Kong University of Science and Technology, where he coordinates the School of Humanities and Social Science creative arts initiatives. Composer of Turtledove Tone etc. Damin Ren, famous composer and theorist, Professor of Composition & Music Theory, Director of Music Research Institute at Xinghai Conservatory of Music in China. 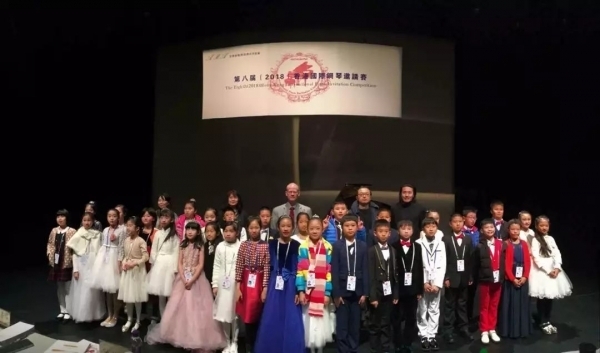 He is many conservatories’ visiting professor, such as Central Conservatory, China Conservatory, Shanghai Conservatory and Wuhan Conservatory. His magnum opuses include chamber music Mountain-song for Violin and Piano，Fantasia—Octet and Cantonese Capriccio for Cello & Piano (commissioned by the Schoenfeld International String Competition 2013 and won Award of Outstanding Composition); monograph Harmony of Pop & Jazz, Fundamental Music Theory; translations The New Grove Dictionary of Jazz and The Cambridge History of Western Music Theory. 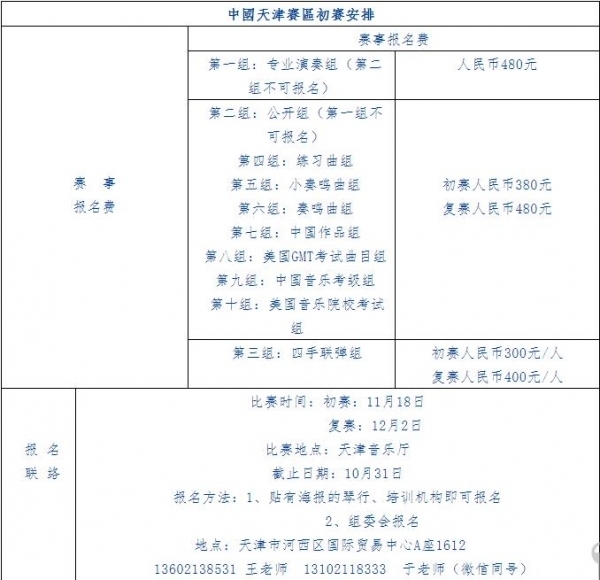 One of the following four commissioned works（arranged by Damin Ren ）should be chosen. One of the following four commissioned works（arranged by Damin Ren）should be chosen. Contestants should entry according to their class’s prescription. In all classes where an age limit is stated, contestants are requested to submit their I.D./passport to verify their age. Contestants should not give any inaccurate or misleading information. Otherwise, the application will be disqualified. Decision made by panel judges is final and should not be disputed. Contestants may enter more than one class. They must state clearly the classes on the same form and fill in the total amount of entry fees. Entry fees are not refundable or transferable. Contestants must perform the piece(s) as stated in the entry form. no substitution,Otherwise the performance will not be marked. Performance exceeding the specified time may be terminated. Contestants are required to arrive at the competition venue 15 minutes prior to the competition start. The competition committee could alter the time of competition when is required. Contestants could not object to the change. If the performances are not up to the required,the Organizing Committee can withhold the prizes Accordingly. All contestants should participate in preliminary round competition in their province, if there is no local preliminary competition, contestants should submit their DVD of performance to the committee as preliminary round basis. Specifics can consult Mainland office of Asia Musicians Association. Contestants should submit the entry form, photocopy of identity document, entry fee and DVD of performance to Asia Musicians Association mainland office before Nov 20, 2018. The list for the final round should be announced before Dec 10, 2018.